The first Brooklyn Park Mayor’s Prayer Breakfast was held in October of 1991 at the Northland Inn in Brooklyn Park. Mayor Jesse Ventura welcomed the nearly seven hundred guests who attended that morning. Minnesota Governor Arne Carlson brought a greeting from the State, and Adolph Coors IV was the featured speaker. The prayer breakfast was held again in 1992. This was followed by a period of three years, 1993-95, in which the prayer breakfast was not organized and held. 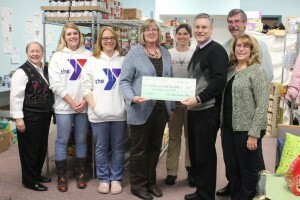 On December 4, 2011, Brooklyn Park Mayor’s Prayer Breakfast committee members Pastor Steve Larson (chair), Annette Lund (treasurer), Linda Gustafson (secretary), and Pastor Adriaan Overbeeke presented a check to the No Barriers Youth Food Shelf. Also in attendance to accept the check were Rev. Rachel Morey, Marilyn Evans (pastor of Brooklyn United Methodist Church), Annette Willers (CEAP), and Point Northwest members Kim O’Grady and Laura Lekander. Due to the leadership of individuals in the community and the encouragement of Mayor Grace Arbogast, the next Mayor’s Prayer Breakfast was planned for October of 1996. The prayer breakfast continued to receive support from Mayor Arbogast, and then from Mayor Steve Lampi. Since 1996, the Mayor’s Prayer Breakfast has been an annual event, occurring in October or November, usually at the Marriot Northwest/Northland Inn. Each year, the featured speakers have shared in various ways how God has worked in and through their lives. The programs over the years have included special music from a variety of musicians, from school groups to professional musicians. Words of greeting have been brought from officials serving in Washington and in our state offices. In recent years, the committee has chosen a local organization to highlight. At the 2011 prayer breakfast, the work of the No Barriers Youth Food Shelf was highlighted. Housed at Brooklyn United Methodist Church, CEAP and the YMCA’s Point Northwest group give support to this food shelf with food donations and volunteers. Rachel Morey, pastor of Mosaic United Methodist Church, shared staggering statistics about the rapid increase in youth homelessness in our community and challenged listeners to do their part to end this problem. Dozens of youth, ages 12 to 21, use the services of the food shelf each Wednesday evening. Thanks to the generous sponsorships and donations, the Brooklyn Park Mayor’s Prayer Breakfast was able to present a check for $500 to CEAP, designated for the No Barriers Youth Food Shelf.